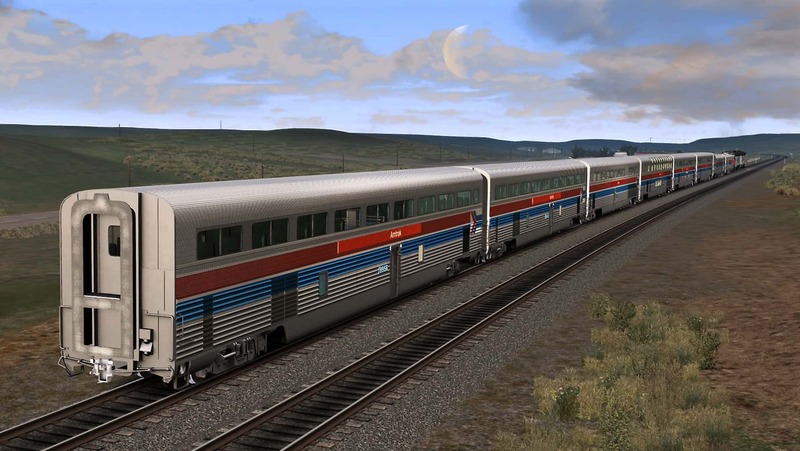 Through the digital artistry of DTM, Amtrak’s Electro-Motive SDP40F is now available for Train Simulator – and with it, Amtrak’s extraordinary ex-Santa Fe Hi-Level passenger cars that were the inspiration and benchmark for today’s Amtrak Superliners! When it came to passenger service, the Santa Fe Railway was all class, and among the finest and most famous trains in America was AT&SF’s El Capitan, which was the coach-class sibling of the incomparable first-class, sleeper-equipped Super Chief. Into the mid-1950s, Santa Fe’s El Capitan was equipped with traditional single-level equipment which, while luxurious, dated to 1938. Santa Fe and passenger car builder The Budd Company collaborated on the design and development of a new El Capitan – and a remarkable one indeed. The new El Capitan would be made up of Hi-Level cars which provided not only magnificent views of the American West for travelers, but substantially increased train capacity for the railroad. While the standard version of the 1938 El Capitan accommodated 350 passengers, the new Hi-Level edition would carry just short of 500 passengers (and, in a 12-car consist, weigh a robust 900 tons). Santa Fe’s Hi-Level El Capitan entered service on the railroad’s 2,224-mile run between Chicago and Los Angeles in July 1956. 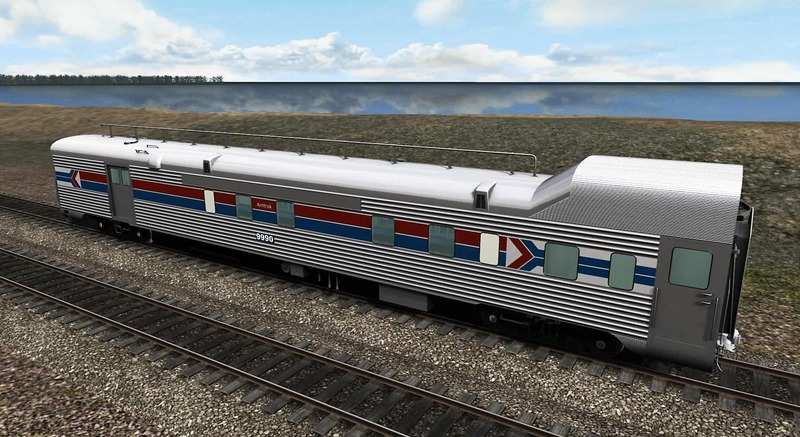 To provide daily service in each direction, AT&SF invested $13 million to acquire 73 cars which included two original prototypes, 22 68-seat “step-down” coaches (which would allow connection to single-level equipment), 37 72-seat coaches, six lounge cars, and six diners. Another 24 Hi-Level coaches were acquired in 1964, and in the mid- to late 1960s, Hi-Levels also became regulars in the consists of Santa Fe’s Texas Chief. 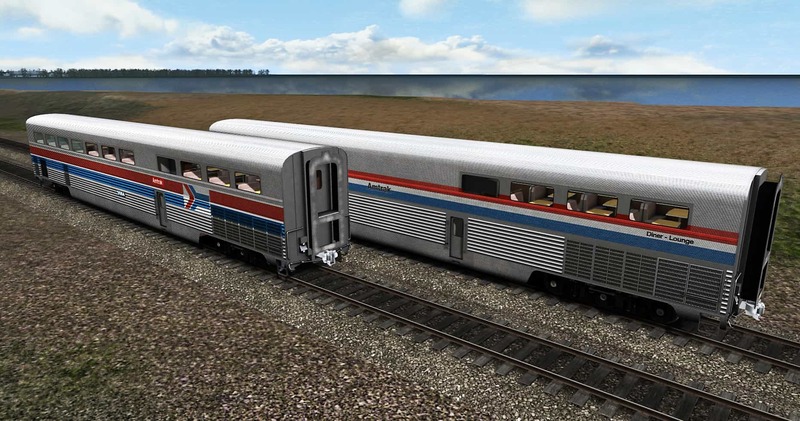 For the traveler, the Hi-Levels offered reclining seats with lots of leg room, a diner that seated 80 passengers at a time, and a lounge car with panoramic window views. I can personally vouch for the grandeur of the experience of the Hi-Levels, having as a teenager traveled on the Hi-Level El Capitan from Chicago to Los Angeles. With the coming of Amtrak in 1971, the Hi-Levels joined the roster of the new national passenger railroad and, in addition to continued service on the Chicago-LA and Chicago-Texas routes, the Hi-Level equipment would eventually see service on a number of Amtrak’s long-distance western trains. Many of the Hi-Level cars remained in Amtrak service into the current century and the lounge cars were employed by Amtrak on the Coast Starlight into 2018. 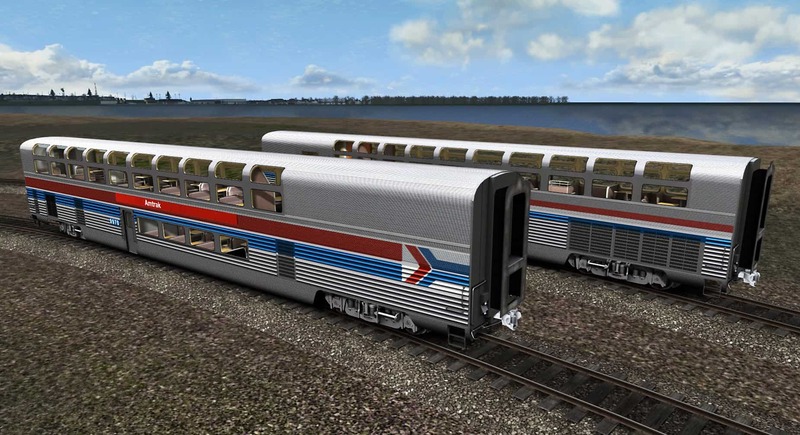 While the long era of the Hi-Levels on Amtrak perhaps has closed, their legacy certainly continues, given the cars were largely the design inspiration of Amtrak’s Superliners as first introduced in 1975 and which continue today as the primary equipment for Amtrak’s long-distance western services. 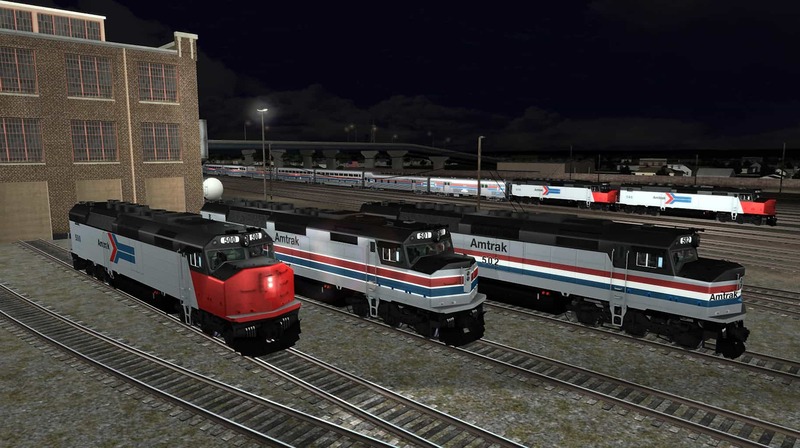 As introduced and detailed in the Dovetail Live articles “Memorable, but Star-Crossed” and “Authentic Amtrak” (linked below), the Amtrak Electro-Motive SDP40F is now available for Train Simulator – and partner-programme member DTM has also included a complete set of Amtrak Hi-Level equipment, dressed in both Amtrak’s Phase I and Phase III passenger car liveries. 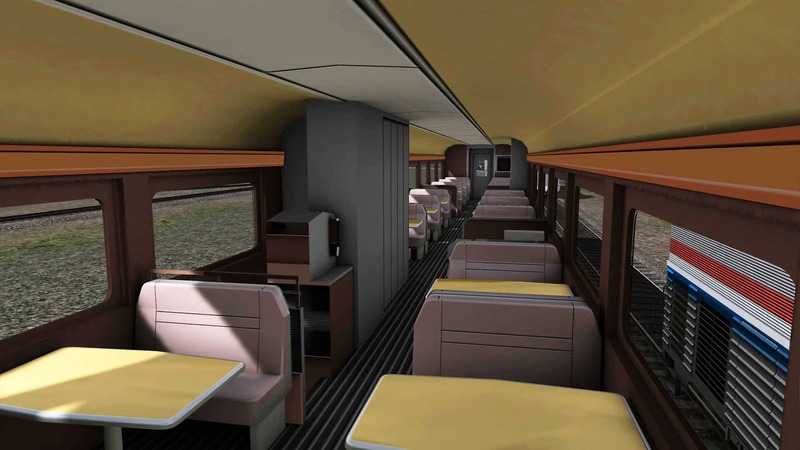 Included in the SDP40F pack will be: AT&SF-style single-level baggage-express car; unique baggage-dorm transition car; Hi-level standard and “step-down” coaches; Hi-Level lounge; and Hi-Level diner. 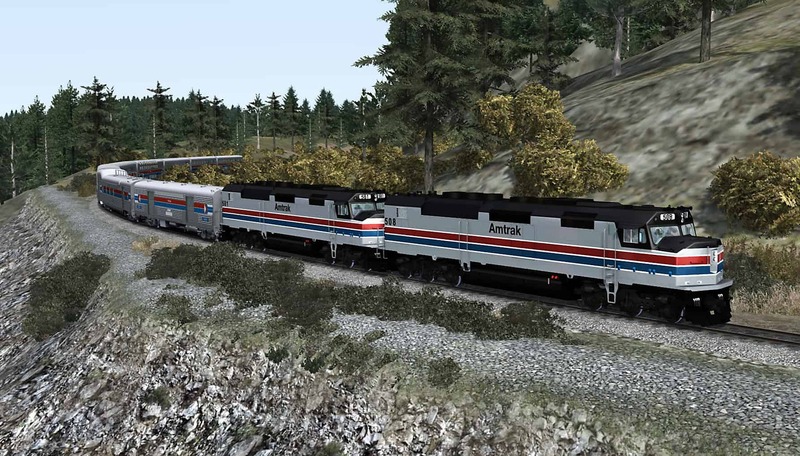 Amtrak’s Electro-Motive SDP40F in three authentic liveries is available now for Train Simulator – and with it, Amtrak’s extraordinary ex-Santa Fe Hi-Level equipment that was the inspiration for today’s magnificent Amtrak Superliners! Screenshots by Gary Dolzall. 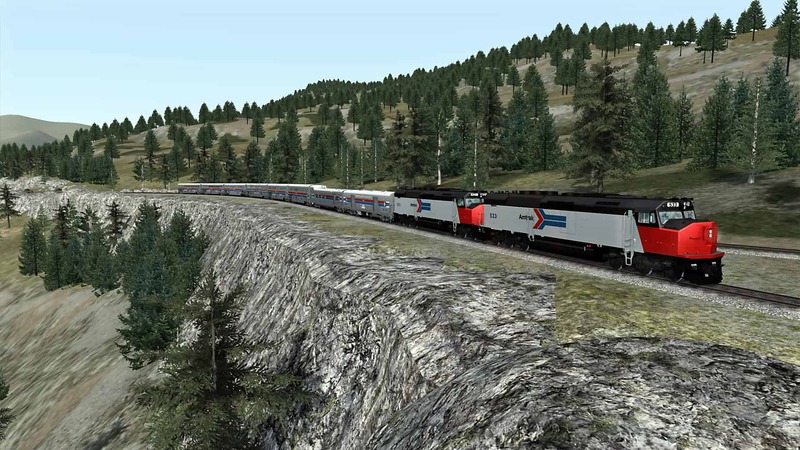 With a classic consist of Hi-Level cars that originally served Santa Fe’s luxurious El Capitan, a pair of Amtrak SDP40Fs climb the east slope of Train Simulator’s Donner Pass route. 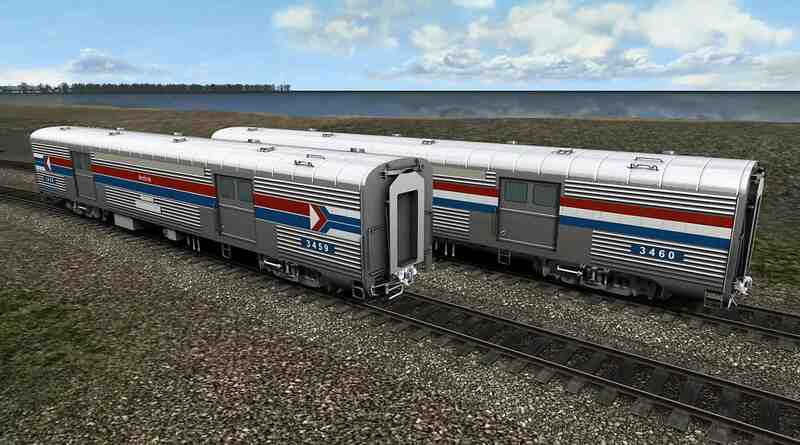 Along with the Amtrak EMD SDP40F, partner programme member DTM has created a complete consist of ex-Santa Fe Hi-Levels. Riding behind the locomotives will be an ex-Santa single-level baggage-express car (above) and unique baggage-dorm transition car (below). Built by Budd and entering service in 1956, two variations of the Hi-Level coach were created: A “step-down” coach which seated 68 and provided access to single-level cars (front) and a standard 72-seat Hi-Level coach (rear). Passenger seating was on the upper level, while rest rooms, a crew room, and space for equipment and storage were below. The Hi-Level dining car (above and below) served 80 passengers at tables on the upper level and housed the kitchen, equipment, and storage space on the lower level. Six diners were constructed to protect the daily schedule (in each direction) of Santa Fe’s El Capitan on its 2,224-mile Chicago-Los Angeles journey. Christened “Sky Lounges” by the Santa Fe, the 65-foot-long lounge cars (above and below) offered magnificent viewing of trackside scenery. The car provided seating for 60 passengers up top and 26 more in a small lower lounge. With the creation of Amtrak in 1971, Santa Fe’s Hi-Level cars migrated to Amtrak service and most served into the present century. 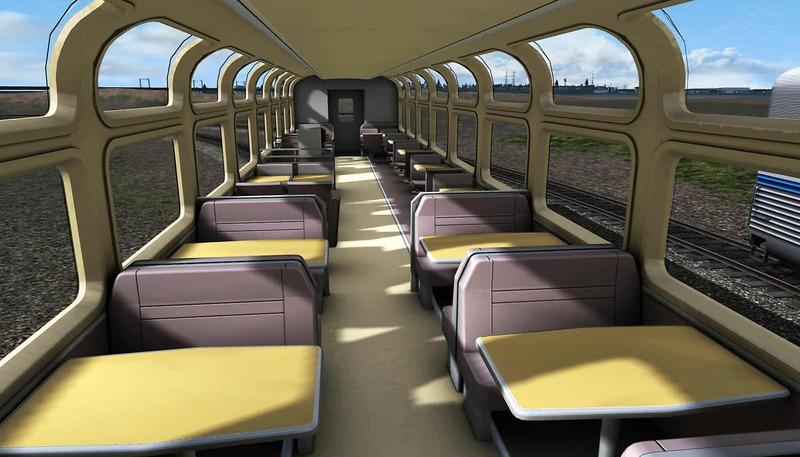 The lounge cars, in fact, were only retired by Amtrak in early 2018. 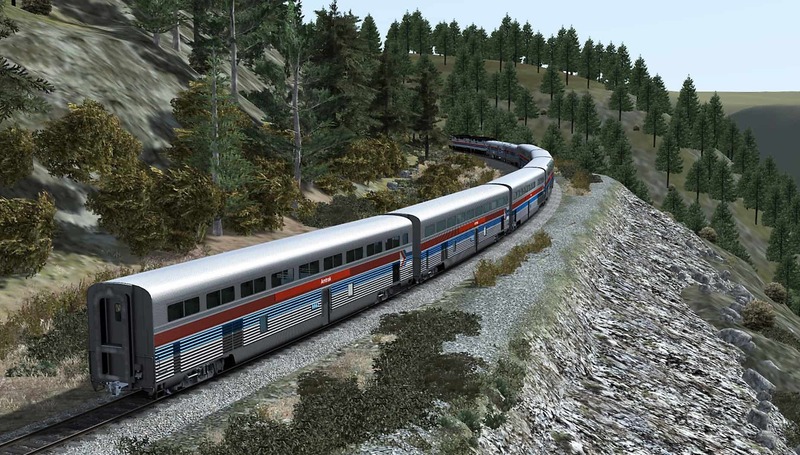 Wearing Amtrak’s “Phase II” locomotive livery, a duo of SDP40Fs lift a Hi-Level consist up the west slope of Train Simulator’s Donner Pass route (above and below). 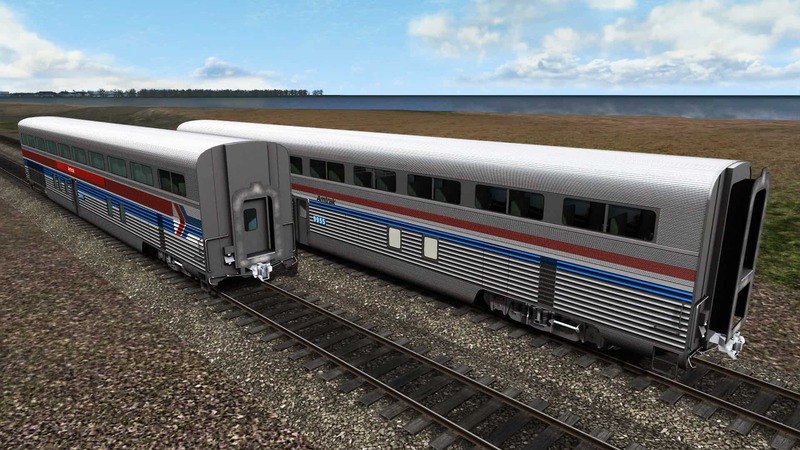 The Amtrak SDP40F and distinctive Amtrak Hi-Level cars make for an extraordinary new Train Simulator experience – and they’re available now!